The holiday season in Jackson Ho-Ho-Hole is special indeed, from snowy sleigh rides among the elk, to Santa sightings and skies full of fireworks to usher in the New Year. How can the holidays be anything but happy in Jackson Hole? A myriad of merry abounds from beneath the twinkling lights encircling the famous elk antlers in Town Square to the steep slopes of the area’s trio of ski resorts — Jackson Hole Mountain Resort, Snow King Mountain and Grand Targhee. 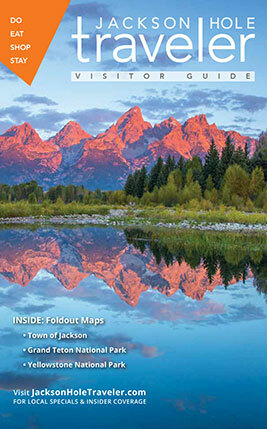 Country Living magazine recently named Jackson Hole one of America's "20 Best Small Towns for Christmas" Ranked No. 4, the article says: "No town lights up for the holidays quite like Jackson. The town at the base of the Tetons has a spectacular Town Square any time of the year, with monumental arches of elk antlers at the four corners. But around the holidays, the arches are wrapped in strings of lights to illuminate the nights with a festive glow. Stick around until New Year's Eve if you want to see the torch parade of ski instructors snaking down the mountain at the town's two ski resorts." Here are a few activities to help make your seasonal vacation bright. Oh, what fun you can have in a one-horse open sleigh, jingling and (slowly) dashing across the snowy expanse of the National Elk Refuge. Every day —except Christmas — from 10 a.m. to 4 p.m., visitors can get up close and personal with the thousands of wapiti who call the elk refuge home each winter. Each red sleigh can carry up to 16 people. There are cushioned benches to sit on and cozy, colorful wool blankets to drape over your lap during the one-hour ride. Jolly Old St. Nick is holding court on Town Square every night starting December 15th, from 5 to 7 p.m., until Christmas Eve, when he then needs to depart to fly around the world. Join Santa in his workshop at the Stage Stop building on the southwest corner of the square. Santa Claus will also be dropping by Jackson Hole Mountain Resort — he is literally scheduled to rappel out of the Aerial Tram! — on Christmas Eve at 4:30 p.m. And on Christmas Day, you and the kids can even ski with the big man in red on Teewinot and Casper. The famous Jackson Hole Playhouse—named one of the "Top Attractions in Jackson Hole" by TripAdvisor—will present its annual Christmas show from Dec. 13 through January 5, 2019. The dinner theater's musical comedy offering for the holidays is called "Holidays at the Playhouse." Tickets for dinner and the show in the Playhouse's Saddle Rock Saloon are $80 for adults, $60 for children ages 13 to 17, and $50 children ages 5 to 12. Seating is very limited, so act now! Call the box office at 307-733-6994 or visit jacksonholeplayhouse.com. Start your New Year’s Eve off in an amazing way by viewing a mountain torchlight parade at Jackson Hole Mountain Resort, Snow King Mountain or Grand Targhee. Each parade is followed up by an equally awe-inspiring fireworks display. Snow King hosts the oldest torchlight parade in the valley. Since the 1950’s, intrepid, expert Jackson Hole skiers have ridden to the top of the mountain and then—torches in hand—made their way slowly down the town hill in dramatic, fiery fashion. The parade starts at 6:15 p.m. and fireworks are at 7. Over in Teton Village, Jackson Hole Mountain Resort is set to host a “Glow Worm Parade” at 5:30 p.m. for children up to age 14. Glow sticks substitute for torchlights as the kids traverse down the Eagles Nest run from the top of the new Sweetwater Gondola. At 6 p.m. the resort’s employees will treat revelers to their traditional torchlight procession on Apres-Vous, with a fireworks show to follow in the Village Commons. Over in Alta, Wyoming, at Grand Targhee Resort, the Kid’s Glowstick Parade starts the New Year’s Eve fun off at 4:30 p.m. The adult’s torchlight event fires up at 5:30. Jackson Hole Mountain Resort is hosting some family-friendly apres ski events during Christmas week. On December 23rd, kids can make ornaments at Kids' Ranch from 4 to 5 p.m.; on the 23rd and 24th you can skate with Santa on the Rink on the Commons from 3 to 4 p.m.; on December 26th meet birds of prey from Teton Raptor Center from 4 to 5 p.m. at the Four Seasons Resort; from 4 to 5 p.m. on December 27th enjoy some very cool stargazing with Wyoming Stargazing in an indoor planetarium in Walk Festival Hall; on December 28th from 4 to 6 p.m., kids young and old are invited to ice skate on the Village Commons rink, then warm up by the fire with free hot cocoa and cookies (skate rentals will be free, too! ); and on the 29th from 4 to 5 p.m., go behind the scenes with snowcats and avalanche dogs at the Kids Ranch. On the 30th, kids can decorate cookies at Kids' Ranch. For more detailed information, read our blog post on all the holiday happenings in the Village.